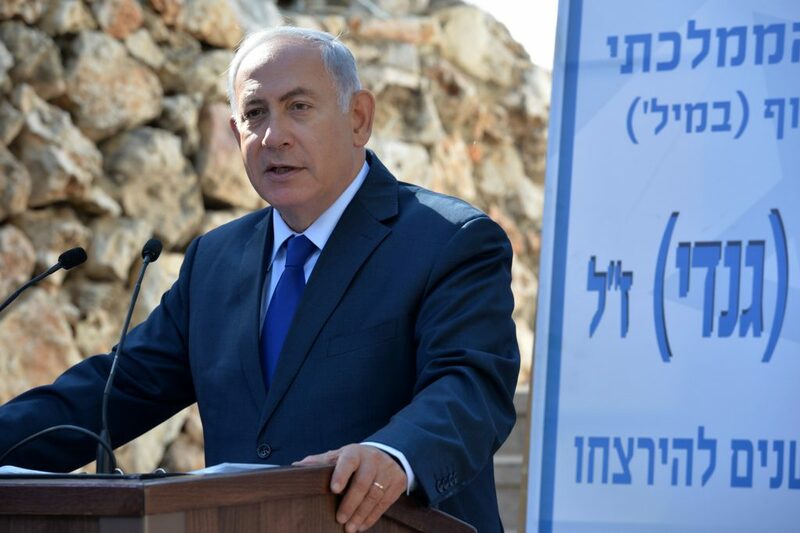 YERUSHALAYIM – The 16th anniversary of the assassination of Israeli minister Rehavam Zeevi, Hy”d, on Tuesday was marked by controversy, as Israeli Prime Minister Binyamin Netanyahu defended his memory against those on the left who would repeal the official state commemoration. Zeevi, who was serving as tourism minister at the time, was shot and killed by Arab terrorists in a hotel in Yerushalayim. MK Michal Rozin (Meretz) said she will introduce a bill to repeal the law to commemorate his death. The right-wing Zeevi, head of the Moledet party, was a nemesis of the left for his advocacy of transferring the Palestinians of Yehudah and Shomron who do not hold Israeli citizenship to other countries. Meretz MK’s boycotted the memorial ceremony. Knesset Speaker Yuli Edelstein said, “Gandhi was a victim of Jew-hatred and hatred of Israel, of terror that seeks to terrorize the Jewish public in Israel and throughout the world, a terror that does not distinguish between man and woman and between a boy and an old man, and they saw in him — in Gandhi — a special target. We bow our heads today to the memory of a man who devoted his entire life to the defense of the homeland,” said Edelstein. Zeevi served for many years in the IDF, where he had a distinguished career and reached the rank of general. The memorial for Zeevi coincided with the news that the parliament in Iraq’s autonomous Kurdish region decided to postpone legislative elections for eight months amid tensions with the central government in Baghdad over disputed territories. Netanyahu recalled that Zeevi had gone on a secret mission to the region in the 1960’s, where he supervised the establishment of an Israeli army field hospital. “The visit made a deep impression on him,” Netanyahu’s office quoted him as saying in Hebrew. “He came face to face with warm expressions of support for Israel, which continue to this day. “The Kurds demonstrate national maturity and international maturity,” said the prime minister.